Teralytic’s soil sensors monitors soil quality to maximize crop yields and reduce over fertilization. 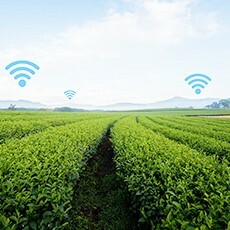 Semtech Corporation announced that Teralytic, a manufacturer of wireless soil sensors, implemented LoRa® devices and wireless radio frequency technology (LoRa Technology) in its wireless sensor to detect nitrogen, phosphate and potassium (NPK) levels in soil to help farmers reduce waste and to improve crop yields. According to recent reports, between 70% and 80% of agricultural greenhouse-gas emissions, such as nitrous oxide, come from the production and use of nitrogen fertilizers. Farmers need real-time visibility into soil conditions while working in their fields. During growing season, manual soil tests fail to provide the data growers need and this can cause farmers to either over fertilize or under fertilize, harming profits and/or the environment. The Teralytic sensor is a battery-powered, meter long device that farmers stick into the ground. Packed inside are 26 different sensors that measure the surrounding soil’s NPK levels, pH levels, soil moisture, temperature, and aeration, as well as the temperature and humidity above ground. Teralytic launched its LoRa-enabled NPK soil sensor at the recent World Agri-Tech Innovation Summit in San Francisco on March 20, 2018.